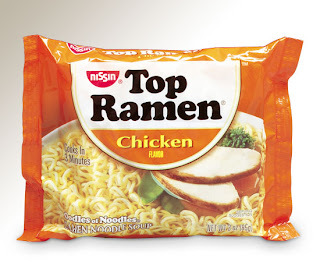 In college, I was addicted to Top Ramen along with almost every other college student. Then I took a long hiatus. Now, I fell into the trap of seeing it in the grocery store and bought some packs. I think my addiction might have roared it's ugly head again. I ate SOOO much of this in college that I can't physically eat anymore. But it was oh good for all those years. SODIUM OVERLOAD!! Heart attack in the making! Go have yourself a brownie....you know, for your health's sake!!! Hmmmm, out of the ordinary crabby-ness, sudden ramem cravings . . .
No, I'm not pregnant. There are perfect explanations. 1) went to the foodstore hungry so that's why I picked up a few of the packets. 2)it's the time of the month so that's why i'm crabby. I had such a Ramen addiction in college! One of my roommates used to love to eat it raw, I remember. I still get a craving for it every now and then!